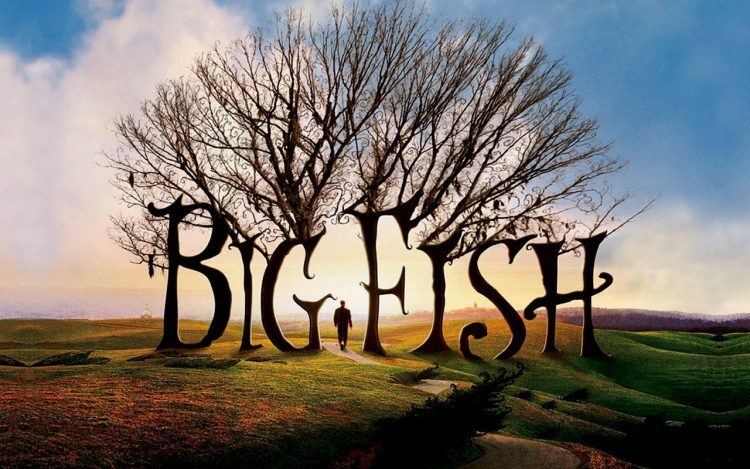 Many critics would have you believe that Big Fish marks a huge departure for director Tim Burton. But while visually this may be true, in essence this heartwarmingly surreal tale of loneliness, inability to fit in, and struggling with being misunderstood by the world make this perfect Burton material. And recovering from his shaky Planet of the Apes remake, he delivers his most mature work so far. Edward Bloom [Albert Finney] has always told tall tales about his oversized life as a young man [Ewan McGregor]. His fabulous exploits take him from small-town Alabama around the world meeting giants, witches, and a pair of conjoined lounge singers, until he finally meets and woos his true love, Sandra [Jessica Lange]. While his tales capture and charm almost everyone, his frustrated son Will [Billy Crudup] is struggling to learn the truth of his dying father’s life before it is too late. Unable to change his Edward, Will must learn to separate the fact from the fiction as father and son are reunited. The driving force of Big Fish is its characters and the casting is simply superb. Finney’s scenes were apparently filmed first, allowing McGregor to watch and assimilate some of his mannerisms into his younger portrayal. Crudup is able to amply portray Will’s frustration as he finds himself unable to connect with his father. And the resemblance between the wonderful Lange and Lohman as the younger and older versions of Edward’s wife is uncanny. McGregor is particularly successful in walking the same fine line as the story itself, balancing between the real and unreal without ever seeming absurd or silly. Will’s wife is an especially beautiful character, being both the perfect wife and a charming fresh audience for Edward’s anecdotal stories, her brow knotting prettily in concern as he tells the delightfully twisted tale of the prophetic crow. The performances are all heartfelt, but Mcgregor manages to blend this with Burton’s quirkiness perfectly. Burton’s eye for such absurdity is brilliantly realised and the new bright palette is both striking and suitable for the usually darker-toned director. The dazzling special effects are used exactly as they should be, to enhance the story and complement the selection of vividly portrayed cameo characters, not to overshadow them as is so easy in this age of big-budget Hollywood extravagance. The cameos are indeed crucial to the pacing of the film. Every scene in which Danny DeVito or Steve Buscemi appear are filled with such vibrance that the audience are swept away with the tales just as Edward’s own audiences are. 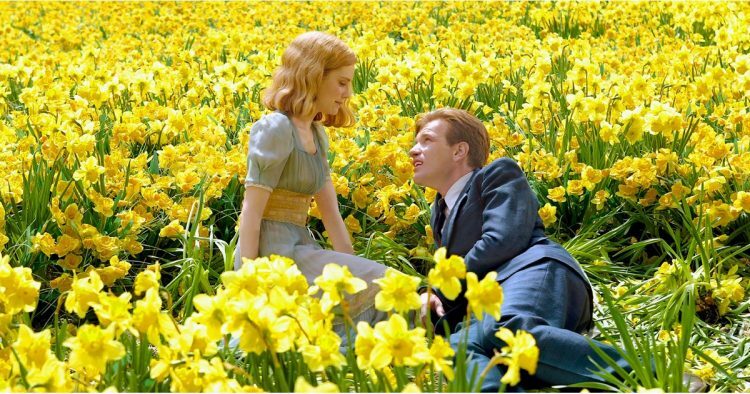 Big Fish is ultimately a film of beautiful and breathtaking moments in the extraordinary tale of an ordinary man. One of the most moving is a simple sequence with scarce dialogue in which Lange slides into a bath with Finney, both fully clothed, and their love could not be better displayed. Our first glimpse of the siamese twin singers is simply stunning, and equally the other myriad of visually crafted images like the field of daffodils Edward uses to woo his wife in one of the sweetest, grandest cinematic romantic gestures. Equally, underplayed scenes such as the delicate hospital sequences at the end become all the more moving in juxtaposition, as they gain an added intensity. Burton freely admits he was influenced here by the recent death of his own father, although he adds that he was never particularly close to his parents. But Burton’s true skill is in carefully drawing and manipulating the emotions of his audience. As Edward is beaten by his future wife’s boyfriend, we first wince in pain, then laugh at McGregor’s inane grin, and then are filled with real concern as he lies broken, all within a few seconds. We cannot help but be endeared to both father and son which makes us intrinsically a part of Will’s discovery that sometimes fact and fiction are not so far apart, and sometimes they cannot be unravelled at all, in the “surprise ending” Edward always promised his death would be as he saw it in a witch’s eye so many years before. While whimsical on the surface, Big Fish represents Burton’s most mature and personal work to date. Perhaps it marks a new and more honest direction for the director, but it certainly ranks among his best with it’s delicately balanced poignancy and humour.